Traditionally, prediction models for disease risk in individual patients are limited to the follow-up time (eg, five or 10 years) of the original study. In a few studies, most of the study participants may have reached an endpoint before the end of follow-up.5 6 Conventional statistical models can then suffice for making lifetime predictions. Usually, however, the remaining life expectancy of study participants is much longer than the follow-up duration of studies. Many participants are still healthy and alive at the end of the study. Simple extrapolation of risk predictions beyond the follow-up time of the original study is often precarious. Therefore, lifetime models compared with traditional survival models use age instead of follow-up time as the underlying timescale. A participant does not enter the study at time 0 but rather at his or her age at study entry. Similarly, the time to event or censoring is defined by the age of study exit. This is called left truncation and right censoring, respectively. Each study participant contributes data to the survival model from the age of entry until the age of censoring or disease event.7 8 As a result, predictions of lifetime models are not limited by the follow-up time of the study but rather by the age distribution of study participants. Therefore, observations in elderly patients are essential for stable long term predictions. For making lifetime predictions, the techniques of adjustment for competing risk and an age based time axis need to be combined. A well known example of such a model is the JBS3 calculator (www.jbs3risk.com/).13 14 For this purpose, methods adapted from the Fine and Gray model are available for standard statistical software.8 15 Such risk scores consist of separate cause specific models for the event of interest and the competing event. As with any prediction model, it is recommended to limit the number of predictor variables and choose readily available patient characteristics to optimise ease of use in clinical practice. The same set of variables is used for prediction of the event of interest and the competing event. This is because dropping a variable for the prediction of only one of both outcomes leads to loss of information without the benefit of a simpler model. A covariate for the effect of treatment should be included in the models that are based on trial datasets. Probabilities at and bt can be predicted for each age interval t using a competing risk adjusted lifetime model. For each subsequent age interval t, the probability of being healthy and alive at the start of that interval (et+1) can be calculated as et×(1−at−bt). The disease-free life expectancy of an individual patient follows from this life table as the sum of et+1 multiplied by the width of each interval t (∑et+1×interval width). This is illustrated in the real data example and table 1⇓. The survival curve for an individual patient results from plotting of the life table. Notably, the area under this survival curve is equal to ∑et+1×interval width. Thus, the area under the survival curve is a graphical representation of the individual disease-free life expectancy. The effect of treatment on disease-free survival can be obtained by computing the survival difference with and without treatment. The treatment effect, in terms of gain in healthy life expectancy, is equal to the difference between the area under the survival curves of both scenarios. Aspirin is effective for preventing cardiovascular disease in the primary prevention setting.16 Similar to other types of treatment for the prevention of cardiovascular disease, aspirin is thought to be most effective in people with a high risk of cardiovascular disease in the next 10 years. This is because the NNT is generally lower (that is, more favourable) in patients at high risk.17 18 Because age is by far the most important determinant of 10 year cardiovascular disease risk, aspirin is thought to be most effective in older patients (>65 years).17 Yet age is also the most important determinant of death from non-cardiovascular causes. In this case, such death may precede the occurrence of a cardiovascular disease event, and thus it must be considered a competing risk. This is because patients who die from non-cardiovascular causes may not benefit from aspirin at all, even when their 10 year risk of cardiovascular disease is high. Therefore, aspirin treatment is a classic example where doctors need to consider competing risks when estimating the treatment effect for individual patients. To illustrate these concepts we developed a competing risk adjusted lifetime model based on data from the Women’s Health Study. This study was a randomised trial evaluating the effect of aspirin 100 mg on alternate days compared with placebo for the primary prevention of cardiovascular disease among initially healthy women aged 45 or older.3 4 For the present example, we use data on 27 939 participants who provided baseline plasma samples. After a mean follow-up of 10.1 years, the hazard ratio for occurrence of the primary endpoint was 0.91 (95% confidence interval 0.80 to 1.03), favouring aspirin treatment. The competing outcomes were defined as cardiovascular disease (myocardial infarction, stroke, or cardiovascular death) and non-cardiovascular disease mortality. In addition to aspirin treatment, several well established cardiovascular risk factors were prespecified as predictors: smoking, diabetes mellitus, systolic blood pressure, and non-high density lipoprotein cholesterol level. Because observations in very elderly people were limited in the Women’s Health Study, we truncated lifetime predictions at age 85. Supplementary appendix 1 provides additional details on the development and validation of the model. Table 1⇑ shows how the lifetime model was used to construct a life table for a hypothetical patient scenario. Starting from the current age of this patient (in this case 48 years), the cumulative survival without cardiovascular disease (et) gradually decreases towards zero conditional on the yearly rates of cardiovascular disease (at) and non-cardiovascular disease mortality (bt). The cardiovascular disease-free life expectancy follows from this table as the sum of the cumulative survivals for each life year; in this case 22.2 years without aspirin and 22.8 years with lifelong aspirin treatment. The aspirin treatment effect for this patient is 0.6 years, which equals seven months gain in cardiovascular disease-free life expectancy. In figure 1⇓, we have plotted the cumulative survival for this individual patient scenario as a survival curve with and without aspirin treatment. The effect of aspirin is represented by the size of the white area between the curves, which is also equal to seven months. Figure 1⇑ also illustrates the estimated cumulative cardiovascular disease-free survival for the hypothetical patient with no adjustment for competing risks (ie, adding up unadjusted estimates of cardiovascular disease and non-cardiovascular disease mortality). The yearly rates of non-cardiovascular disease mortality presented in table 1⇑ may seem relatively unimportant. Yet, failure to account for these competing risks leads to overly pessimistic estimations of cardiovascular disease-free survival. As a result, the survival curve unadjusted for competing risk may even go below 0, as it does in figure 1⇑. Similar calculations can be performed for all other combinations of risk factor levels (figure 2⇓, top charts). The figure shows the predicted effect of lifelong aspirin treatment for each combination of risk factor levels as the number of months gain in cardiovascular disease-free life expectancy to age 85. These charts can be used to predict the effect of lifelong aspirin treatment for individual patients. Alternatively, an interactive calculator can be used for individual treatment effect predictions (see appendix 2). Notably, an inverse association can be observed between treatment effect and age. The highest treatment effect for aspirin is obtained in younger patients with otherwise high risk factor levels. This is explained by the fact that these patients are at lower risk for competing non-cardiovascular disease mortality. Longer remaining lifetime means longer time at risk for cardiovascular disease events and therefore more benefit from preventive treatment. These findings agree with those from microsimulation studies on both aspirin and statin treatment.2 19 Importantly, starting lifelong treatment at a younger age also means that patients will be exposed to possible adverse events during a longer period. This should be taken into account when making decisions based on predictions of lifetime treatment effect. For comparison, the bottom charts in figure 2⇑ show the absolute 10 year risk of cardiovascular disease for individual patients. 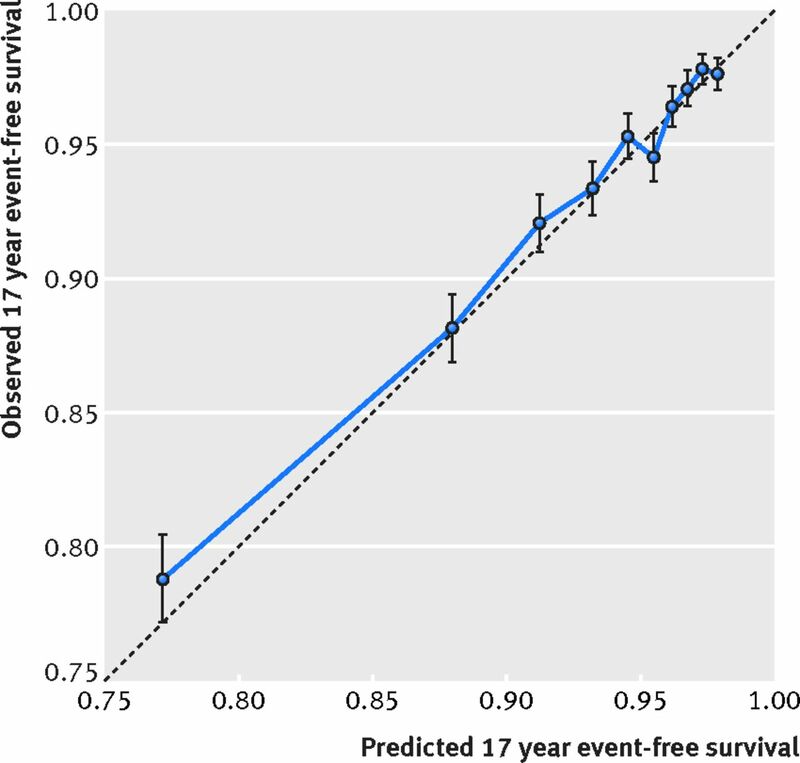 We computed this risk using the same competing risk adjusted model, but based on age specific baseline survival rates for prediction of 10 year risk without the use of a life table (see appendix 1 for details). 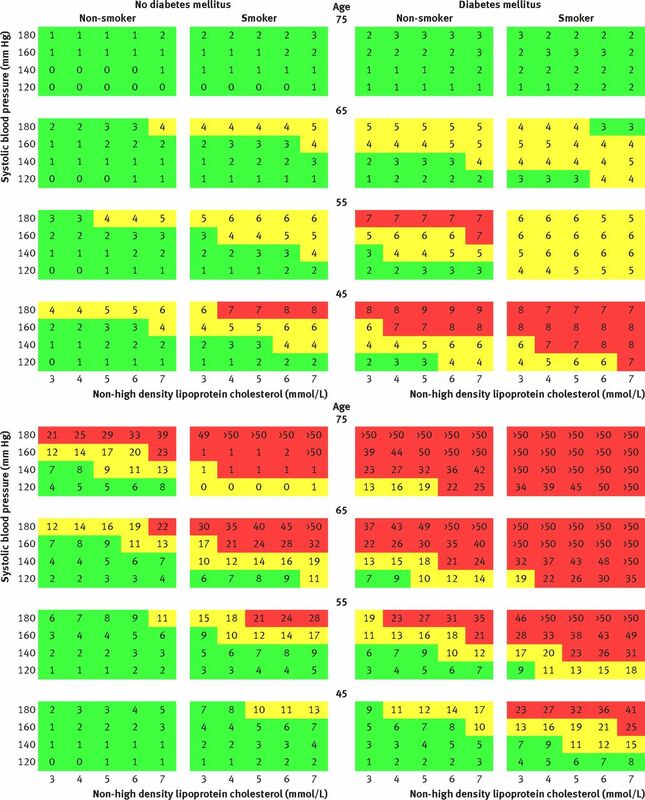 Similar to other risk scores, these colour charts show that the 10 year risk of cardiovascular disease was still higher with increasing age.20 21 Yet apparently a high 10 year cardiovascular disease risk is not always associated with a high treatment effect. This is because older people have a shorter remaining lifetime during which they are at risk for cardiovascular disease events. Because lifetime models predict survival well beyond the duration of the study data, it is often impossible to validate the accuracy of these long term predictions. The example from the Women’s Health Study is, however, an exception. After the randomised treatment period of the study had ended, participants were invited for further observational follow-up, resulting in a total follow-up of 17.5 years.4 Because we used only the first 10.1 years of follow-up data for model development, this allowed us to perform temporal validation. A calibration plot (fig 3⇓) shows that the model’s long term survival probabilities closely match those of the actual (observed) Kaplan-Meier survival in our example. This finding supports, at least for this example, the robustness of the described lifetime prediction methods. Although the highest treatment effect is achieved in younger patients, this comes at the cost of a longer duration of treatment (that is, during the remaining lifetime). For a better comparison of the efficiency of treatment, standardisation of treatment duration may still be considered. For example, the model could be truncated to predict average gain in disease-free life expectancy in the next 10 years. Although lifetime predictions can be insightful for some, others may feel more motivated by short term effects (that is, retaining good health in the near future). Furthermore, in the example we did not account for changes in risk factor levels over time, such as age related changes in blood pressure and cholesterol concentrations. Large fluctuations in these biomarkers are usually not seen until a first cardiovascular disease event. This may be different for other treatment scenarios, which may necessitate the updating of risk factors. In the example, the effect of aspirin was modelled based on randomised trial data. Predictions were truncated at 85 years owing to a limited number of observations in women aged more than 85 years. This is a frequently encountered limitation of randomised trial data, because stringent enrolment criteria result in the exclusion of elderly patients. Moreover, model predictions only apply to patients who would have been eligible to enrol in the trial. Yet observational cohort studies, which usually enrol more heterogeneous patient populations, may also be used for developing competing risk adjusted lifetime models.2 13 14 Assumptions on the relative effect of treatment can then be made on the basis of meta-analyses of trials, if available, and added to the model coefficients. Contributors: JAND and LK designed and carried out the data analyses, interpreted the results, and drafted the manuscript. They contributed equally to this work. RCMK, YG, and FLJV designed the data analyses, interpreted the results, and revised the manuscript for important intellectual content. NRC and PMR collected the data, designed the data analyses, interpreted the results, and revised the manuscript for important intellectual content. All authors had full access to all of the data (including statistical reports and tables) in the study and can take responsibility for the integrity of the data and the accuracy of the data analysis. Funding: This work was in part supported by ZonMw, the Netherlands organisation for health research and development (grant No 836011027). The funder had no involvement in the design of the study; the collection, analysis, and interpretation of the data; and the decision to approve publication of the finished manuscript. Competing interests: All authors have completed the ICMJE uniform disclosure form at www.icmje.org/coi_disclosure.pdf (available on request from the corresponding author) and declare: PMR receives investigator initiated research support from the National Institutes of Health, Amgen, Novartis, Pfizer, and AstraZeneca; has served as a consultant to ISIS, Vascular Biogenics, Boston Heart, Jannson, and Genzyme; and is listed as a co-inventor on patents held by the Brigham and Women’s Hospital that relate to the use of inflammatory biomarkers in cardiovascular disease and diabetes that have been licensed to Siemens and AstraZeneca; no other relationships or activities that could appear to have influenced the submitted work. Briggs A, Claxton K, Sculpher M, eds. Decision modelling for health economic evaluation.Oxford University Press, 2006. Ferket BS, van Kempen BJ, Heeringa J, et al. Personalized prediction of lifetime benefits with statin therapy for asymptomatic individuals: a modeling study. PLoS Med2012;9:e1001361. doi:10.1371/journal.pmed.1001361 pmid:23300388. Ridker PM, Cook NR, Lee IM, et al. A randomized trial of low-dose aspirin in the primary prevention of cardiovascular disease in women. N Engl J Med2005;352:1293-304. doi:10.1056/NEJMoa050613 pmid:15753114. Cook NR, Lee IM, Zhang SM, Moorthy MV, Buring JE. Alternate-day, low-dose aspirin and cancer risk: long-term observational follow-up of a randomized trial. Ann Intern Med2013;159:77-85. doi:10.7326/0003-4819-159-2-201307160-00002 pmid:23856681. Wang SJ, Fuller CD, Kim JS, Sittig DF, Thomas CR Jr, , Ravdin PM. Prediction model for estimating the survival benefit of adjuvant radiotherapy for gallbladder cancer. J Clin Oncol2008;26:2112-7. doi:10.1200/JCO.2007.14.7934 pmid:18378567. Lee ES, Son DS, Kim SH, et al. Prediction of recurrence-free survival in postoperative non-small cell lung cancer patients by using an integrated model of clinical information and gene expression. Clin Cancer Res2008;14:7397-404. doi:10.1158/1078-0432.CCR-07-4937 pmid:19010856. Lloyd-Jones DM, Leip EP, Larson MG, et al. 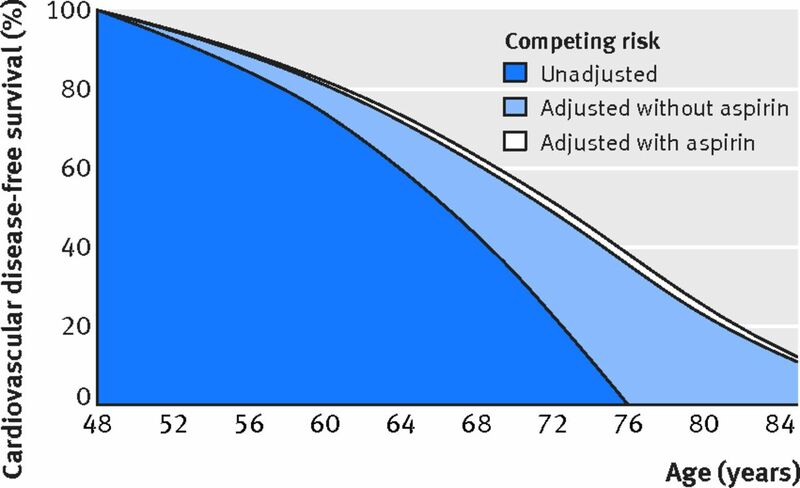 Prediction of lifetime risk for cardiovascular disease by risk factor burden at 50 years of age. Circulation2006;113:791-8. doi:10.1161/CIRCULATIONAHA.105.548206 pmid:16461820. Beiser A, D’Agostino RBS Sr, , Seshadri S, Sullivan LM, Wolf PA. Computing estimates of incidence, including lifetime risk: Alzheimer’s disease in the Framingham Study. The Practical Incidence Estimators (PIE) macro[pii]. Stat Med2000;19:1495-522. doi:10.1002/(SICI)1097-0258(20000615/30)19:11/12<1495::AID-SIM441>3.0.CO;2-E pmid:10844714. Wolkewitz M, Cooper BS, Bonten MJ, Barnett AG, Schumacher M. Interpreting and comparing risks in the presence of competing events. BMJ2014;349:g5060. doi:10.1136/bmj.g5060 pmid:25146097. Koller MT, Raatz H, Steyerberg EW, Wolbers M. Competing risks and the clinical community: irrelevance or ignorance?. Stat Med2012;31:1089-97. doi:10.1002/sim.4384 pmid:21953401. Koller MT, Leening MJ, Wolbers M, et al. Development and validation of a coronary risk prediction model for older U.S. and European persons in the Cardiovascular Health Study and the Rotterdam Study. Ann Intern Med2012;157:389-97. doi:10.7326/0003-4819-157-6-201209180-00002 pmid:22986376. Kent DM, Alsheikh-Ali A, Hayward RA. Competing risk and heterogeneity of treatment effect in clinical trials. Trials2008;9:30. doi:10.1186/1745-6215-9-30. pmid:18498644. JBS3 Board. Joint British Societies’ consensus recommendations for the prevention of cardiovascular disease (JBS3). Heart2014;100(Suppl 2):ii1-67. doi:10.1136/heartjnl-2014-305693 pmid:24667225. Hippisley-Cox J, Coupland C, Robson J, Brindle P. Derivation, validation, and evaluation of a new QRISK model to estimate lifetime risk of cardiovascular disease: cohort study using QResearch database. BMJ2010;341:c6624. doi:10.1136/bmj.c6624 pmid:21148212. Geskus RB. Cause-specific cumulative incidence estimation and the fine and gray model under both left truncation and right censoring. Biometrics2011;67:39-49. doi:10.1111/j.1541-0420.2010.01420.x pmid:20377575. Antithrombotic Trialists’ (ATT) CollaborationBaigent C, Blackwell L, et al Aspirin in the primary and secondary prevention of vascular disease: collaborative meta-analysis of individual participant data from randomised trials. Lancet2009;373:1849-60. doi:10.1016/S0140-6736(09)60503-1 pmid:19482214. Dorresteijn JA, Visseren FL, Ridker PM, et al. Aspirin for primary prevention of vascular events in women: individualized prediction of treatment effects. Eur Heart J2011;32:2962-9. doi:10.1093/eurheartj/ehr423 pmid:22090661. Dorresteijn JA, Visseren FL, Ridker PM, et al. Estimating treatment effects for individual patients based on the results of randomised clinical trials. BMJ2011;343:d5888. doi:10.1136/bmj.d5888 pmid:21968126. D’Agostino RBS Sr, , Vasan RS, Pencina MJ, et al. General cardiovascular risk profile for use in primary care: the Framingham Heart Study. Circulation2008;117:743-53. doi:10.1161/CIRCULATIONAHA.107.699579 pmid:18212285. Perk J, De Backer G, Gohlke H, et al. European Association for Cardiovascular Prevention & Rehabilitation (EACPR) ESC Committee for Practice Guidelines (CPG). European Guidelines on cardiovascular disease prevention in clinical practice (version 2012). The Fifth Joint Task Force of the European Society of Cardiology and Other Societies on Cardiovascular Disease Prevention in Clinical Practice (constituted by representatives of nine societies and by invited experts). Eur Heart J2012;33:1635-701. doi:10.1093/eurheartj/ehs092 pmid:22555213.